You are currently browsing the archives for the Alida Messinger category. There wasn’t much doubt about whether Rep. Jim Newberger represents his district prior to this election. That’s a big reason why he’ll easily win re-election this Nov. 8. Still, Rep. Newberger’s op-ed on Gov. Dayton’s shutting of the Sherco power plants shows how hard he’ll fight for his district. 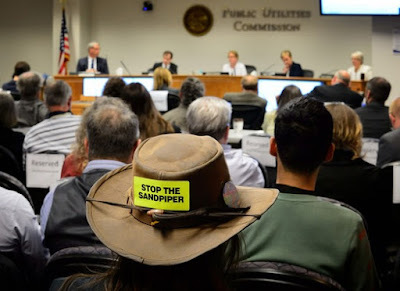 The most alarming part of Rep. Newberger’s op-ed came when he wrote “With all the talk of a ‘transformational’ approach to energy at Thursday’s meeting, the Public Utilities Commission passed on actually deciding how it was going to ‘transform’ our energy grid. 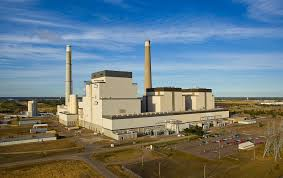 The PUC merely voted to retire two coal-fired units without designating a replacement.” There’s nothing “transformational” about shutting down 2 power plants that supply a large percentage of central Minnesota’s electricity, a significant number of central Minnesota’s private sector jobs and a gigantic portion of central Minnesota’s property tax revenue. I’d say that it’s downright reckless for the PUC to shut down any type of power plant without having a plan on what to replace them with except I know that the Public Utilities Commission has lots of environmental activists on its board. This decision isn’t just reckless. It’s intentional. 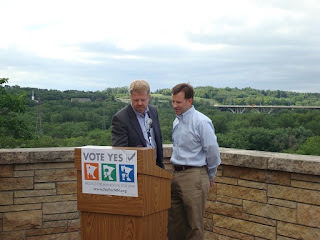 I believe that our natural resources are one Minnesota’s greatest assets. I want to be able to swim in our waters and eat the fish that I catch and I want my children to be able to say the same thing 50 years from now. An ecological balance in a state that is the headwaters is not only a recreational need, but a necessity for our economy and way of life. This isn’t what a principled politician says. It’s what a man who wants to be a green energy lobbyist says. It’s what a politician who doesn’t represent his constituents says. It’s time people understood just how many jobs anti-development environmentalists kill each year. It’s time people understood, too, the impact excessive regulations have on Minnesota’s state budget. This article helps illustrate the negative and devastating impact overregulation has on economic growth. It’s indisputable that moving oil through pipelines is safer than other forms of moving product to market. That fight is finished. Further, it’s indisputable that building the pipeline would create thousands of high-paying construction jobs. Think about this: If a bonding bill is called a jobs bill by the DFL, why shouldn’t building the Sandpiper Pipeline project be called a private sector jobs bill by Republicans? It’s indisputable that the interest that’s paid back by taxpayers on bonding bills costs everyone money, frequently in the form of higher taxes. Interest paid off by companies like Enbridge when they build America’s infrastructure is a net plus on multiple levels plus it doesn’t costs taxpayers a dime in higher taxes. In fact, it’s possible to argue that increased economic growth from the private sector will lower taxes while increasing revenues and raising blue collar workers’ wages significantly. The result of this uncertainty came home to roost earlier this month. Enbridge announced that it had formed a partnership to purchase a pipeline system that would get the Bakken petroleum to market. One of the pipelines Enbridge will purchase is still under construction, and it runs from North Dakota through South Dakota and Iowa to Illinois. This pipeline was permitted in all four states in a year and a half. One thing the pipelines in this system have in common is that none of them travels through Minnesota. Enbridge got what it wanted. North and South Dakota, Iowa and Illinois approved the alternate pipeline route in about 18 months, which is about a third of the time Minnesota had muddled through the permitting process thus far. BTW, North Dakota has better air quality than Minnesota. One of the first things Gov. Mark Dayton did when he took office in 2011 was sign an executive order to streamline decisions on environmental permits. The rhetoric clearly has not been matched by action. It’s noteworthy because Gov. Dayton signed that executive order after Dan Fabian submitted a bill (HF1) to streamline permitting. I wrote then that this was a purely political stunt. There’s little doubt but that I got that right. Minnesota has strong environmental regulations. Unfortunately, it’s also got some of the most untrustworthy anti-development environmentalists in the US. These anti-development environmentalists oppose the Sandpiper Pipeline. They oppose all forms of mining in Minnesota. They opposed the building of the Big Stone II power plant, too. At this rate, the anti-natural resources wing of the DFL, which is the dominant wing of the DFL, won’t permit anything that doesn’t fit their rigid ideology. This article shows that the Iron Range knows that the DFL isn’t their friend. It doesn’t mean that they’re smart enough to vote for Republicans yet but that isn’t surprising. It’s nice that Resolution was defeated but that isn’t a victory. A victory would’ve included approval of permits for PolyMet. A victory would’ve included a resolution stating that the DFL wholeheartedly supports mining unconditionally. Neither of those things happened, which means defeating Resolution 54, though a good thing, wasn’t a victory. The truth is that the metro DFL controls the DFL. That won’t change anytime soon. In fact, that’s likely never to change. The only way for the Iron Range to truly win is for them to switch to voting for Republicans. Republicans don’t take their marching orders from Alida Messinger. They don’t have to fight environmentalists like John Marty or gun grabbers like Ron Latz or looney tunes lefties like Sandy Pappas. Unlike the DFL, Republicans actually want every region in the state to succeed. The DFL isn’t interested in seeing mining succeed. This weekend’s vote proves that. Republicans would love to see the Iron Range rebound to the prosperity it once took for granted. A rejuvenation of the Iron Range is the true definition of victory. That will only happen when the Range starts voting for Republicans. The plans proposed this year by the House Republicans may be the worst, most damaging proposals I have seen. Instead of continuing the work begun two years ago to rebuild our schools after a decade of divestment, the plans call for a giant $2.2 billion dollar tax giveaway for the rich and corporations. It gets bigger over time and will create a gaping budget deficit, while offering an increase in education that is so low it would result in cuts to our schools. First, it’s dishonest to call the Republican tax cut a “tax giveaway for the rich and corporations.” I can’t dispute the fact that the Republican tax bill includes tax relief for small businesses. Next, there aren’t any tax cuts for big corporations just like there aren’t big tax cuts for the Mark Daytons or Alida Messengers of the world. This is a doubling down on the dark days of the 2000s, when we paid for tax breaks for the rich by balancing our budget on the backs of our kids. Ventura pushed for returning surplus money in the form of a sales tax rebate, which some Minnesotans have come to call “Jesse checks.” This year, the average check is $512 for a married couple or head of household, and $232 for a single filer. State officials say all eligible taxpayers should receive their checks by Labor Day. But Ventura cautions that this may be the last year of rebate checks, since the state has cut taxes and the economy has slowed. “We are not bringing in the money that we used to bring in prior to my administration, and in light of that, and the economy, there may not be a fourth,” says Ventura. Two years ago, we finally made real investments in our schools. This gave many hope for our children’s future and the future of Minnesota. We saw free, all-day kindergarten, schools previously relegated to four days able to go back to five-day weeks, and health care and services for families expanded so all can succeed. Despite the “historic investment in education”, property taxes in many school districts skyrocketed. What’s worse is that the achievement gap isn’t improving. That isn’t reason for celebration. That’s justification for worry. Whenever the DFL uses terms like “tax giveaway for the rich and corporations”, that’s proof that they’re spinning. It’s proof that they aren’t telling the truth. Adding bird-safe glass to the Minnesota Vikings’ new stadium could add as much as $60 million in extra costs and delay construction by six months, the chairwoman of the Minnesota Sports Facilities Authority said Friday. Chairwoman Michele Kelm-Helgen gave the estimate in response to complaints that the clear glass planned for the $1 billion downtown Minneapolis stadium would pose a threat to migratory birds, Minnesota Public Radio News reported. First, this is what environmental activists do. They make things up, then talk about the potential for crisis. This is fiction. Second, if this was a legitimate problem, which it isn’t, who cares? Why should the Vikings have to spend an additional $60,000,000 to prevent birds from flying into the new Vikings stadium? Why should they have to wait an additional year to move into their new home? Most importantly, why didn’t these environmental activists mention this when the blueprints were first released in May of 2013? If there was a Republican governor and Republican-picked chair of the Minnesota Sports Facilities Authority, they’d tell these environmental activists to take a hike. What’s better is that organizations like Minnesota Citizens for the Protection of Migratory Birds wouldn’t have standing to proceed with a lawsuit because they can’t show how they’d be harmed. It’s poetic justice that the political party that specializes in doing special favors for special interests is getting hassled by their most special of special interest allies.